Wireless 12V PWM fan control for dobs? Member CharlesC started a topic today in using a surprisingly cheap wireless $3.99 PWM LED controller for a dew heater. I currently use a similarly priced LED dimmer switch to drive a 12V fan behind the mirror on my 10" dob. 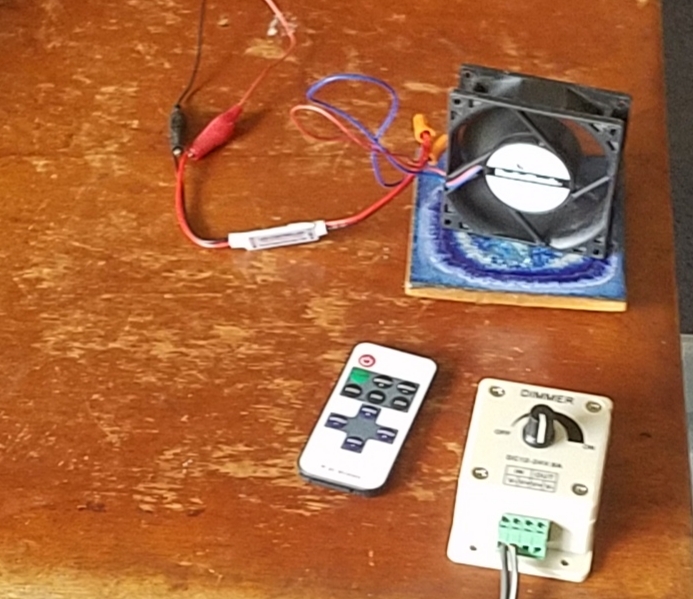 I started to ask questions on the applicability of that controller on fans and decided instead to start a new thread on wireless fan control. I would love it if I could turn my fan up with a remote in my pocket for rapid mirror cooling or dew control (since the breeze through the OTA really does usually clear dew off my secondary) . I could also get rid of all wires coming off my dob since this is the only electrical item on it. If this item shared by CharlesC has a fast enough frequency I suspect it could do the trick at 25, 50, 75 and 100% fan speeds. Thoughts? Warnings? Other successful methods, anyone? Edited by jtsenghas, 19 October 2018 - 05:45 PM. I played with remote driving a LED. Since it is designed to dim LEDs it strobes them fast enough that they appear to dim. The PWM spec says it has 256 levels but I don't think the up/down buttons give you that many levels. Maybe 10 levels, but I didn't count them. The three level buttons, 25%, 50%, 100% would probably suffice for dew heater or fan. It has a mode button for many flashing/fading patterns which isn't needed. Label on module says input of 5v-24v with 12A peak which is different than spec. Here is spec from ebay ad. By the way, for anyone reading who is not familiar with Pulse Width Modulation, the concept is simple. It is simply an adjustment of a high frequency on/off function that operates at full voltage. The portion of the cycle for which the voltage is "on" is called the duty cycle. If the duty cycle is at 50% of the frequency, then the voltage is switched off for half the time. Above about 50 Hertz (cycles/second) an LED appears to be simply dimmed. When used on a fan, a PWM dimmer still operates at the same voltage and torque, but runs slower. This is vastly better than adding resistors and slowing a fan down by wasting power to heat. With PWM fans still run smoothly and efficiently at lower speeds. My dimmer switch can run the fan at about 20 percent speed and cause no noticeable vibration at the eyepiece and have small batteries run it for many sessions. Imagine doing that wirelessly! Edited by jtsenghas, 19 October 2018 - 06:28 PM. I bit too and just ordered one. The shipping is free. How on earth can someone make a profit at that price? just think - numbers...its all about numbers. My unit arrived today and works perfectly!!! In the attached photo the original hard-wired dimmer switch can be seen in the near right of the image. Edited by jtsenghas, 26 October 2018 - 05:20 PM. Hey I bet one could use the same idea for a simple focuser automation too if you have a small motor with the proper gearing. When I first read this I thought this thing can't deliver enough current to do the job, but there you are no smoke! And there's nothing stopping you from using the signal to drive a circuit that can handle more current. For a focuser you'd need a way to reverse the the drive. I guess you could use the different frequencies to have a µprocessor command forward/reverse modes using analog inputs. When I first read this I thought this thing can't deliver enough current to do the job, but there you are no smoke! That's why I asked CharlesC about current in the first place. It can handle a whole bank of back fans and side fans. "Peak current 6 amps" ! I'm also surprised that the on-board component is about the size and mass of a AAA battery. It's just that white thing wired to the fan in the above photo. ... I guess you could use the different frequencies to have a µprocessor command forward/reverse modes using analog inputs. The different frequency choice refers to the "flashing LED" frequency, not radio control command frequencies. The slowest will turn the fan off for a few seconds and then on for about five seconds. I won't use that option for cooling or boundary layer clearing. There appears to be only one radio control frequency. A minor downside is that I can't set up separate controls for side or back fans unless I still use the original dimmer switch. For that matter, if several members of my astronomy club get these we may accidentally be turning on and off and up or down each other's fans at public observing events! Edited by jtsenghas, 29 October 2018 - 12:43 PM.